You know what today is! 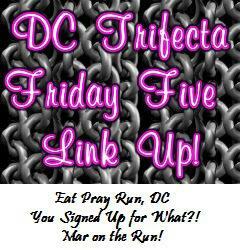 It’s Friday, so we are linking up for the Friday Five, with three amazing DC area bloggers: Mary at Mar On the Run, Cynthia at You Signed Up For What?! and Courtney from Eat Pray Run, DC. Feel free to join the fun with your own Friday Five post and be sure to visit and comment on the other blogs on the linkup! Today, we are talking about Five Trips. Oh, boy. The PugRunner family loves traveling. For me, it started with summer vacation road trips, where my mom, aunt and I drove to pretty much every state on the Eastern seaboard, and west to Kansas and Texas. In high school, I had the opportunity to spend a week in Europe, visiting Paris, Rome, Florence, Lucerne and Barcelona. I took a bit of a hiatus while in college but started up again afterwards, and now Mr PugRunner and I try to travel as much as we can, with and without little man. We spent a lot of time trying to figure out our honeymoon. Mr PugRunner was all about a cruise or visiting a tropical destination, and I wanted to DO something. So we compromised on Maui. And since we were going to be over on the West Coast, it only made sense to make a pit stop in Napa and San Francisco while we were there. We had the most wonderful time in Maui. We stayed at the Ritz Carlton, and tried to squeeze as much into six days as we could. We rode horses in the Kaanapali crater. And took our rental Mustang on the Road to Hana. In addition, we gorged ourselves on fresh pineapple, macadamia nuts and seafood. 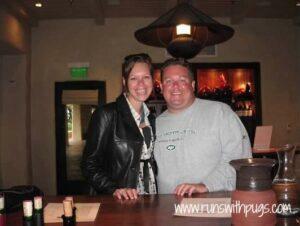 On our return to the mainland, we detoured to Napa Valley to visit some wineries. And we ended our trip in San Francisco, with visits to Alcatraz and Fisherman’s Wharf. For my 30th birthday, we were planning to go to Cancun. We had a resort booked, and were starting to look at excursions to some of the ruins, when we were gifted with an opportunity to go to Paris. Since we were going to be in Europe and Mr PugRunner had never been to Italy, we extended the trip to include Rome and Venice. We spent every day exploring the sights and museums and churches. I don’t think we ever stopped. Off the top of my head, we visited the Vatican, the Colisseum, Catacombs, Spanish Steps, San Marco Square, the Louvre, Eiffel Tower, Les Tulieres, Sacre Coeur, Notre Dame and Roland Garros. And there was still so much more to do and see. It may be a while before we return to Europe, but I can’t wait. For Mr PugRunner’s 40th birthday, I surprised him with a trip to Atlantis. I tried to be incredibly chill about it – not really making any plans, except for one excursion, because he prefers to be spontaneous and not have to adhere to any kind of timetable. There was no way I was missing dolphin snuggle time. We loved the resort, the pina coladas and all the fun things to do on property. We spent three days just relaxing and enjoying each other, and we both loved it. For my birthday, Mr PugRunner planned a long weekend in Savannah. This is a gorgeous city, full of history and charm. It’s less than three hours away by car, so it makes for a completely doable few days. I had the best time enjoying all the yummy food and walking the streets of the city. It’s the perfect mix of history and fun. There was still plenty we didn’t get to do, so we will most certainly be back. This was the first trip Mr PugRunner and I took together. It was a big deal because we met up with his sister and family, as well as his dad and stepmom. No pressure, right? However, we stayed at a beautiful resort and had the best time in the pools, out on the town and dancing and drinking into the night. What are you top five favorite trips? Share in the comments or write your own post to link up with the Friday Five! Not one but TWO trips with PONIES! Love this post! Even if there were no ponies, I do love the Atlantis. I’ve been twice with my family, both times around xmas/new years. I have so many great memories of those trips! Atlantis is fun. Perhaps a bit too relaxed for me, but that’s ok. It’s good to chill out every once in a while. My dad and I walked over the bridge every morning for fresh conch salad. It’s a whole different world over on the other side! I was also a lot younger when I went and relaxing all day was necessary after the long evenings…. I agree, it’s nice to be able DO things on vaca too! Oh, that I know! I wanted to run that bridge, but I couldn’t get some sleepyhead up out of bed LOL! Napa is so beautiful. It was really rainy while we were there, so i feel like we need to get back in nicer weather. MOAR WINE! Love your photos and Hawaii is always a great place for a vacation! Your weather was perfect in every single photo at every destination….sweet! My top two non running trips would be Africa and trekking with gorillas, and Antarctica seeing the penguins. Oh, my goodness!!!! Anarctica??? That must have been amazing! You know, it’s funny. I always think we should try to go for more “winter” destinations, since we see the beach and the palm trees more regularly. We’re getting there. That would be an awesome birthday trip. There is so much to do and see, and some of the best food ever! Um, wow–your honeymoon! Three trips wrapped up into one? I would have loved to have done that! My 5 favorite trips in my life have been backpacking through Europe in college and going to Hong Kong, Isla Mujeres (Mex. ), New Orleans, and New York City. It was an awesome honeymoon. I wouldn’t have changed a thing! Hong Kong must be absolutely awesome! All of your trips seem totally wonderful -aside from the horse back riding since I am a chicken when it comes to riding horses! I want to go back to Italy so I can visit Venice! Hawaii is always so wonderful too! Looks like you guys have had some great trips!! Diane @runninrocker recently posted…Rockin’ Vacations! I love horses. I want horses. I don’t know if it will ever happen, but I keep asking LOL! Venice is one-of-a-kind. I’ve honestly never experienced a city quite like it. All of these trips look wonderful. It would be awesome to ride a horse in the ocean. I like to do stuff on my vacations. I would love to ride in the ocean again. It was like being on a jet ski when the horse got it too deep to stand and started swimming. Yeyyyy travel, my favorite topic in the whole wide world! Like you I grew up taking family road trips across the country every summer.that seriously shaped me into who I am today! The American West is still my favorite place on earth. Right now I’m trying to get ready to head to Peru in a few weeks! I know! Travel is so great! I have really not spent much time out west. I’ve been to Vegas, Texas, Kansas, several cities in California, and that’s pretty much it. We need to try to get over there. You’re well traveled lady. I’m slightly envious of your Hawaii and European trips. I have yet to venture either destinations yet. Hopefully one day in the not to distant future I will be able to add a few more stamps to my passport. I think travel is our favorite hobby! Wow! looks like some amazing trips! 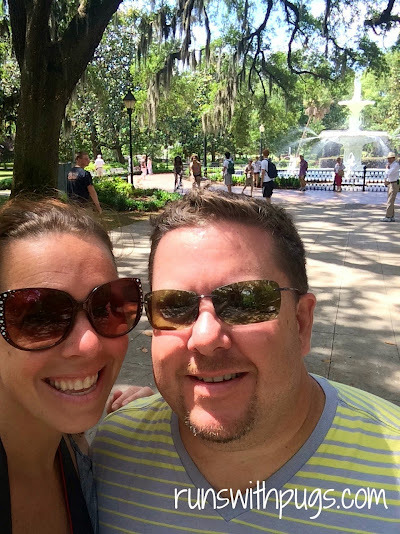 My sister and I went to Charleston last year…Savannah was on our list, but it didn’t make the cut. Maybe another time. We have got to get to Charleston! Beautiful city and great racing community! Took a girls trip to St. Martin for my 40th bday this summer- so much fun!! Your trips and pics look awesome! I only wish that I had had my good DSLR when I went on these trips. Or at least my iPhone camera. Such a difference in pic quality! I would LOVE to do that horses on the beach excursion! That’s one trip I’ve missed out on all three cruises. And the swimming with dolphins thing. Definitely top on my list. I’ve been to Atlantis as well and it’s definitely relaxing. Outside of Atlantis is a little sketchy though- Nassau was kind of dirty and the beaches had broken glass everywhere! I always try to go on the horse related excursions. I’m pretty predictable that way. Those swimming horses are pretty cool. I love that second picture of you two on your horses in the Kaanapali crater. What a great picture! That was one of my favorite excursions. It was so cold and so beautiful. Swimming with the horses was phenomenal. what fun trips! I loved San Fran and touring Alcatraz. We flew into London for our honeymoon and made our way to Paris. Tons of fun! I love all inclusive resorts too- Mexico and Jamaica have some great ones! You make me want to book a vacay! NOW! Mary Beth Jackson recently posted…fabfitfun Spring edition- unboxed! I’ve been to Mexico and Jamaica (riding horses on the beach, obviously) via another cruise I took. I don’t love all-inclusive (or cruises, for that matter) because I like being out and about and seeing what is going on in the place I’m visiting, but I’m notoriously bad at relaxing and obsessed with exploring LOL. I am a traveler like you…I grew up traveling and went on tons of trips in college and before we got married. Kory isn’t much of a traveler so I still go on girls trips. I’ve been to almost every place on your list–Napa Valley is the one I haven’t been to but it’s definitely on my bucket list!! And swimming horses?!?!?!? I sooo want to do that! What a great post with so many awesome pics!! I visited savannah last year and fell in love quickly! I’ve always been curious about Atlantis so thanks for sharing that you guys had a great time! Absolutely! We really did have fun there. I don’t know that I could visit a lot or stay longer than 3 or 4 days at a time, but it’s definitely a great place to go, especially if you can score a great deal. I am hoping to run a race in Savannah one of these days. I think it would be perfection. Wow. You have been to some amazing places. Abby @ BackAtSquareZero recently posted…Is Orange Theory Fitness Impacting My Running? I hope to add many more!